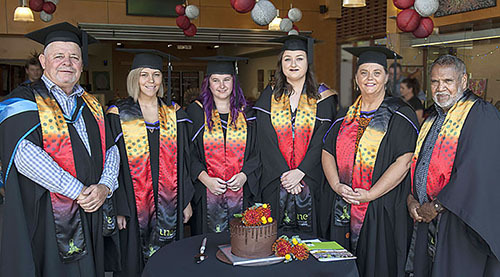 We are proud of the Aboriginal and Torres Strait Islander students who will graduate in 2019. The graduation dates for the Schools is below. 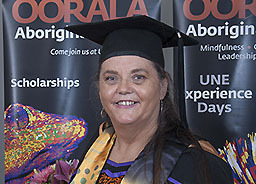 Oorala holds a Sashing Ceremony on each of these days, to acknowledge Aboriginal and Torres Strait Islander students’ academic achievements alongside other Aboriginal & Torres Strait Islander students. This is held prior to the Graduation Ceremony in the Oorala Lecture Theatre. Oorala Staff will be on hand to assist and direct you on where you need to be..
image : Dec 2018 - Cutting the Graduation Cake: Greg Davison, Director Oorala Aboriginal Centre, Laken Edwards, Samantha Brown, Eliza Barnett, Judith Peen and Mr Colin Ahoy, UNE Elder-in-Residence. Graduates can download our FAQ and Checklist sheet to help you.